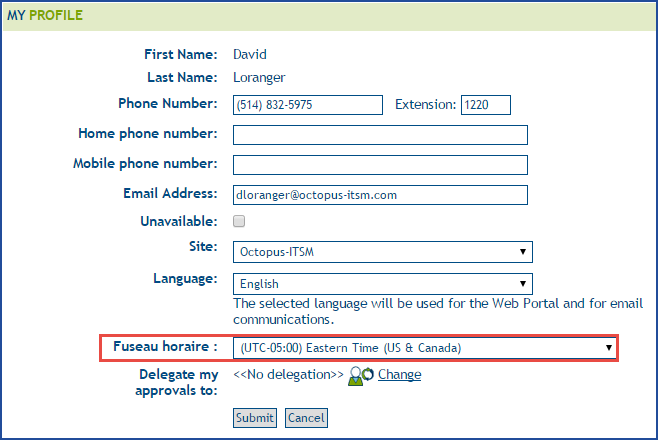 Octopus uses information from time zones to adequately present date and time on the Web portal. 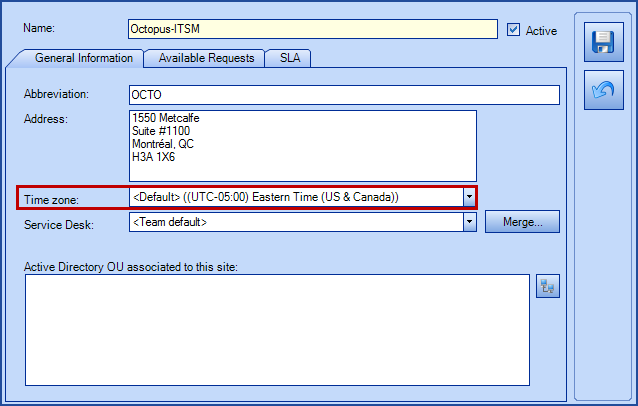 The time zone configuration is done through the Options menu of Octopus, near the end of section 3. The default application time zone is Eastern Standard Time (EST). Some customers could already be set in a different time zone following a changed configuration on our part. Once the main configuration is completed, you will be able to modify the time zone of each site from the Reference Data Management menu. This allows you to indicate in which time zone the site resides. It is not necessary to specify the time zone of each sites since they will, by default, get attributed the global configuration time zone. From a user profile, the time zone is displayed below the Octopus tab. From the Web portal, a user can access his time zone from his profile page. For assignees, the time zone will be detected by the Octopus application from the Windows local time zone each time the application is launched. Therefore, it is not useful to modify an assignee's time zone since it will get replaced by Windows' at the next launch.